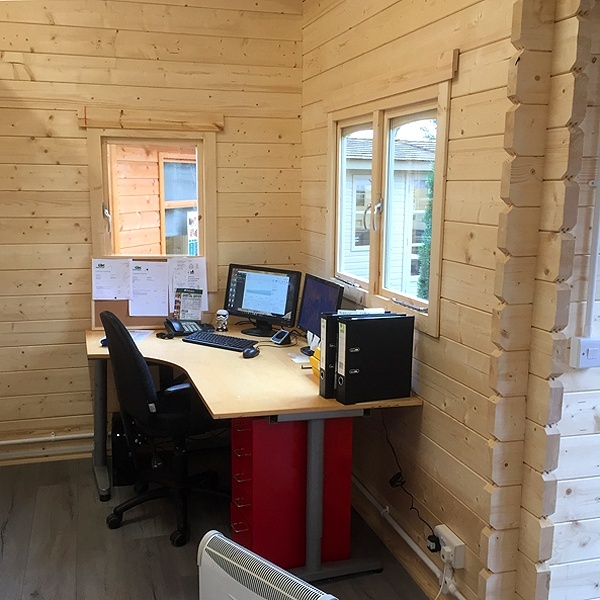 The Hakoinen is a stunning, open plan log cabin which maximises space and has a wide range of potential uses. Perfect for young entrepreneurs for use as a home office or small business hub. 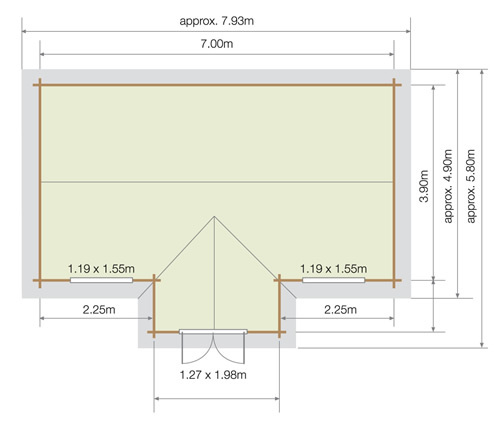 Why not use the large 29.8m² floor plan as a games room or even just a comfortable and cosy sitting room to entertain your friends and family. The Hakoinen has a stunning 3.65m high roof which makes it perfect for use as a small spar or home gym. 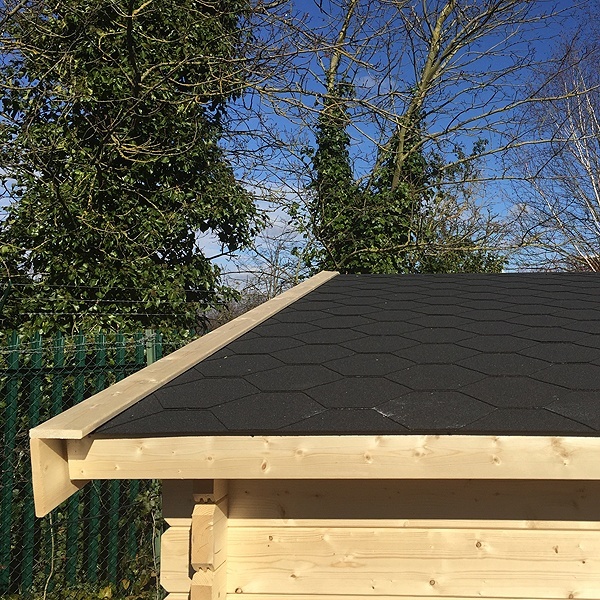 The Hakoinen includes a charcoal felt shingle roof for long lasting protection, double glazing to limit any heat lost through the windows and doors, and strong 21mm thick, tongue and groove flooring sitting on 3in x 2in treated floor bearers. For that quality finish, the bitumen felt shingles are supplied in an attractive charcoal colour. The Hakoinen includes strong and durable 21mm tongue and groove floorboards sitting on 3in x 2in pressure treated floor bearers with a damp proof membrane to prevent rising moisture. The Lillevilla Hakoinen features a porch area which instantly makes the building a feature in any garden. The Hakoinen log cabin is a fantastic year-round garden building. 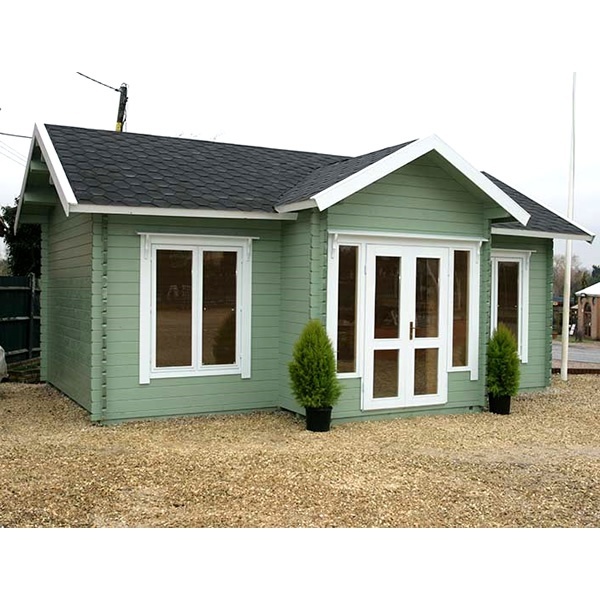 Perfect for use as a garden office, small business workspace, gym, recreation room and much more! Featuring a open floor plan for maximum space and an attractive 1m deep porch area. This model has been treated with a low maintenance, water resistant oil treatment to keep that classic, rustic look. Our range of Restol Wood Oil is available in a variety of finishes. Please click here to view this range. A contemporary log cabin. 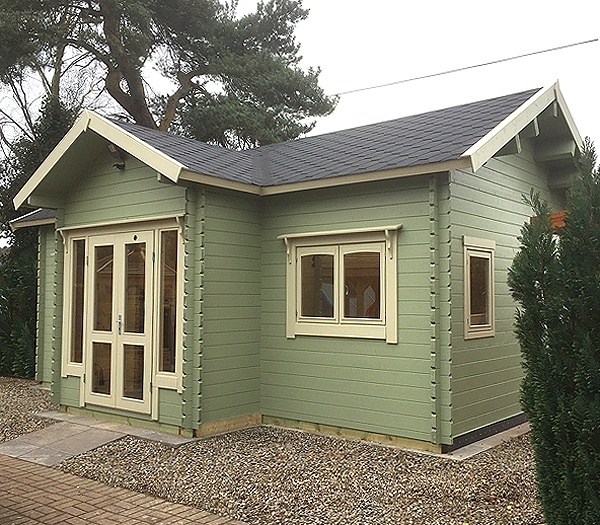 The Pavilion style of the Hakoinen provides a classic feel that would enhance any garden. 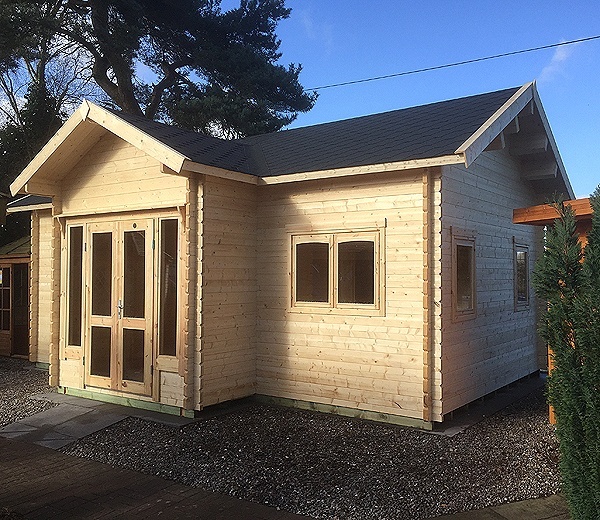 At 7m x 3.9m and with a 2.5m x 1m porch, the Hakoinen provides a large, multi purpose garden building. You'll find this fabulous Hakoinen on show at our Hagley branch in the West Midlands : accessible from all parts of the country. 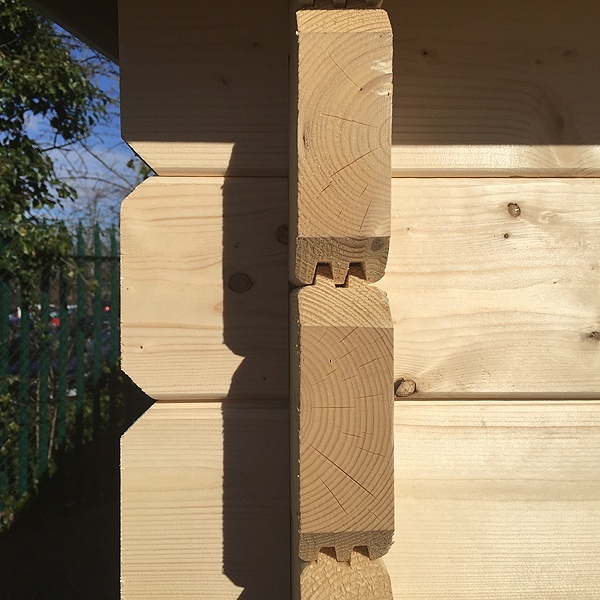 if you want to take a look at the high standard of construction of this premium building then it's a great opportunity to 'see before you buy'. We've modified the windows to make desk space beneath them as we use it as an office, all year round. We've painted it after installation: there's another picture in the gallery of this building once installed without the paint finish. The building is delivered flat packed, installed should you choose that option from us, but the final paint coat is down to you or a local contractor. Have a look at our Protek Royal Exterior range and choose between a huge range of colour finishes! 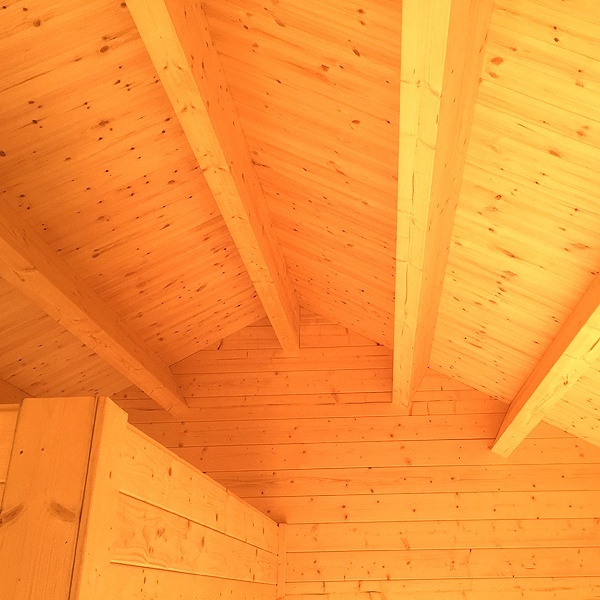 The Hakoinen, pictured shortly after installation, in pine log finish before painting. The finished building is shown painted green elsewhere in this gallery. You can use a clear preservative if you want to retain the pine log look. This is another internal picture of our Hakoinen, used by us all year round as office space. The windows on this Hakoinen were changed from the usual full length glass to allow us to place desks beneath them. 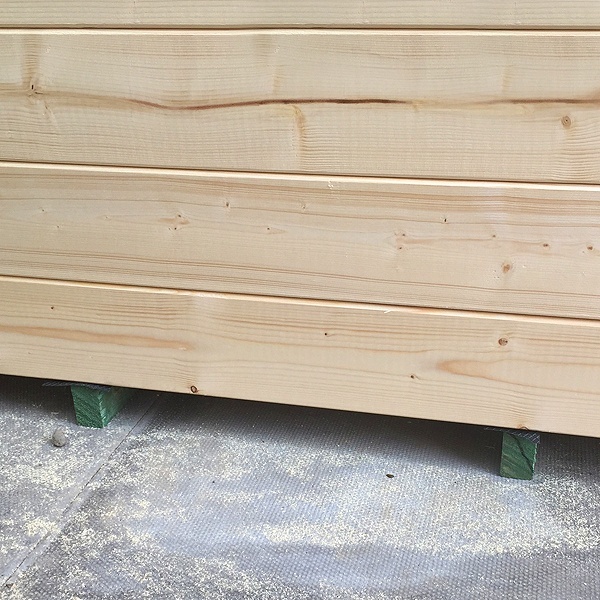 We've laid a laminate floor on top of the sturdy pine t&g floor that is supplied with the building. This is an internal shot, looking up into the roof of the Hakoinen. The roof purlings on the Lilleville Hakoinen are incredibly impressive! Please take a look at our display model at our Hagley branch in the West Midlands. The structure you see in the bottom of the picture is a partitioned area where we keep the most important item of equipment...the kettle! 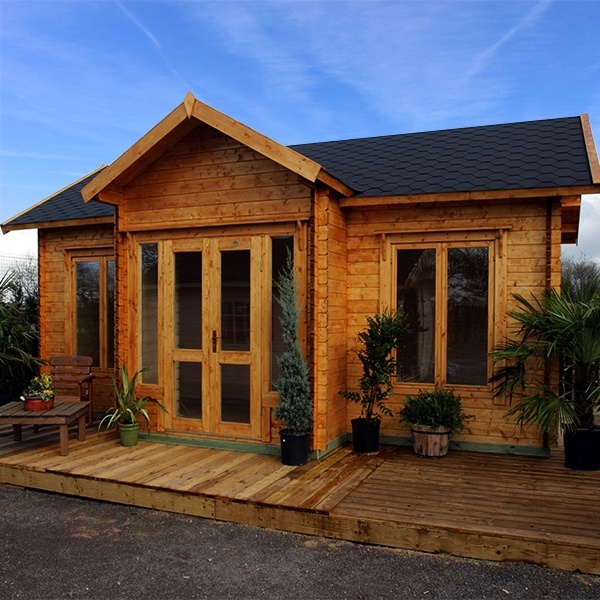 These attractive and hard wearing felt shingles are provided as a standard feature with this cabin.